The analysis of meat inspection data at slaughter suggests availability of genetic variation for most common indicators of poor animal welfare. That way, genetic selection can be a tool in reducing the risk of diseases, thereby reducing pain and suffering of animals. Meat inspection data along with the genetic selection for economically important production traits can be used to enhance animal welfare, so much became clear from a recent publication in the peer-reviewed journal Animals. Researchers from breeding company Topigs Norsvin and Wageningen University & Research, the Netherlands, delved deeper into this topic*. The article was published in early 2018. The researchers wrote that in many slaughter plants, animal health and welfare are monitored during meat inspection at slaughter. Carcasses are usually examined by meat inspectors and remarks are made with respect to different diseases, injuries and other abnormalities. Those data are also valuable for disease prevention and enhancing animal welfare but are rarely used for that purpose. The researchers therefore set up the following trial. The scientists analysed data on carcass slaughter remarks of 140,375 ﬁnisher pigs to investigate the possibility of genetic selection to reduce the risk of the most prevalent diseases and indicators of sub-optimal animal welfare. These pigs came from slaughter plants in Germany, between 2011 and 2016. The animals came from 13 farms in Germany and the Netherlands, and were given the names ‘Farm A’ until ‘Farm M’. The researchers also examined effects of non-genetic factors such as differences between farms, sexes and growth rates. The most frequent slaughter remarks were pneumonia (15.4%), joint disorders (9.8%), pleuritis (4.7%), pericarditis (2.3%) and liver lesions (2.2%). Pedigree records were available; those data the team used for genetic analysis. In total, the research team analysed 5 conditions as indicators of poor health and sub-optimal animal welfare. 1. Pneumonia: An inﬂammation of the tissues of the lungs. It is mainly caused by viruses, bacteria, or fungi. 2. Pleuritis: Inﬂammation of the tissue layers (pleura) lining the lungs and inner chest wall. It causes breathing difficulties for pigs. 3. Pericarditis: Inﬂammation of the pericardium, the ﬁbrous sac surrounding the heart; this sac holds the heart in place to maintain its proper functioning. 4. Liver lesions: Liver lesions are mainly caused by parasitic infections. White spots, also called milk spots, are observed in the liver of affected pigs. 5. Joint disorders: This includes bursitis and other disorders leading to inﬂammation of joints. The bursa is a sac ﬁlled with lubricating ﬂuid, located between bone, muscle, tendons, and skin to decrease rubbing, friction and irritation. Joint disorders cause pain and difﬁculty in walking for the animal, indicating poor animal health and welfare. 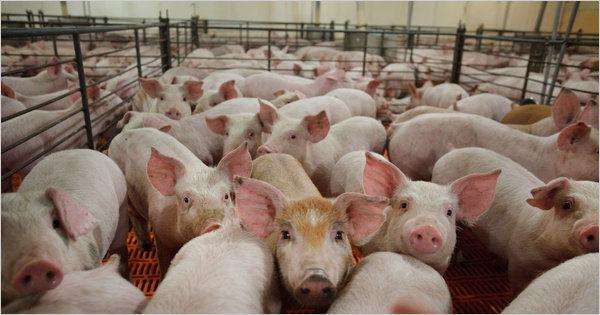 The researchers found that differences exist between farms with respect to the incidences of the slaughter remarks observed at the slaughter plant. Those differences might help to understand the predisposition of pigs to certain health or welfare disorders. In the study, pneumonia and joint disorders had highest incidences, the researchers wrote in their article. Comparing farms with highest number of pigs, ‘Farm L’ with slower growth rate had higher average incidence for joint disorder (13.1%) than ‘Farm M’ (6.1%) which had a faster growth rate. That might suggest that leaner pigs could have higher joint disorders as will be discussed under the section of ‘genetic correlations with production traits’.